Kensington Palace, in London, is famous as the residence of the late Princess Diana. The building was first used as a palace by William and Mary, who bought the mansion in 1689 from Sir Heneage Finch, the Duke of Nottingham. The mansion itself dates back to 1605. The two joint sovereigns hired the great architects Christopher Wren and Nicholas Hawksmoor to convert the mansion into a royal residence. To do that, Wren made separate apartments for the King and the Queen. Today tourists to the palace go through the Queen’s entrance. The palace has an ambiance of coziness, with its warm red brick exterior and relatively small rooms. 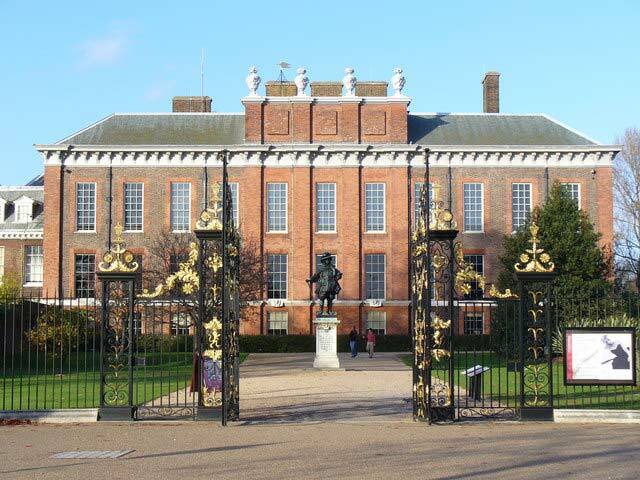 Now, half of the Kensington Palace is divided into apartments for royalty, and half of it is open to the public from March to October and from November to February. Visitors can tour the beautiful rooms and, on the ground floor, they can see exhibits on court dress from 1760 till now. These include clothes and other items worn by Elizabeth II and some of Princess Diana’s dresses. The visitor is greeted at the entrance by William and Mary’s monogram on the hood of the door. After the first floor staterooms, tourists climb the surprisingly plain Queen’s staircase. The King’s Grand Staircase, on the other hand, was designed by Wren and features iron work by Jean Tijou. The Queen’s rooms include her gallery, her dining room and her drawing room. One of the highlights of Mary’s drawing room is a 1695 barometer and a portrait of Henry Wise, who designed the palace’s gardens. A tourist can also peek into the Queen’s bedchamber and see the original elm flooring and the bed with its sumptuous hangings. After that, the guests can move into the Privy Chamber, with its Mars and Minerva motifs. Mars symbolizes William’s military victories while Minerva valorizes the Queen’s womanly wisdom and her patronage of the sciences and the arts. The next room is the Presence Room, decorated by William Kent in uncommonly bright colors. The rooms that belonged to the King were meant to impress, starting with his gallery, which was built by Hawksmoor between 1695 and 1696 and painted by Kent between 1725 and 1726. Here there are depicted many heroic scenes from The Odyssey. Beyond this are the rooms used in a later age by the Duchess of Kent and her daughter, who would become Queen Victoria. There are several items of Victoria’s memorabilia here as well.